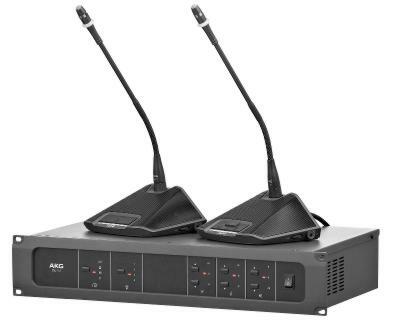 At ISE 2013, Amsterdam, AKG introduced the Discussion System CS3 which offers a variety of different gooseneck microphone options that can be expanded up to 120 units. With a demand for a more simple solution stemming from AKG’s high-end CS5, CS3 is designed to provide users with a plug-and-play professional system. The CS3 BU is a 19-inch 2HE transmitting interface device which controls up to 60 delegate stations. The base station can be used 'stand alone' or remotely controlled by a PC - a feature that will be implemented later in 2013. Multiple working modes enable free or controlled speech as needed during a conference. The base unit is equipped with an extension plug to double the system size with an additional CS3 BU. CS3 CU (chairman unit) is the system’s microphone station, with options to mute all other delegates and activate the 'next in line' feature. The station has a detachable condenser cardioid microphone, available in two lengths – CS321 at 30cm and CS521 at 50cm. The station provides a built-in speaker and two 3.5mm stereo jacks for headphones. The Delegate units, CS3DU 30 and CS3DU 50 have the same basic features lacking the priority and next in line function.